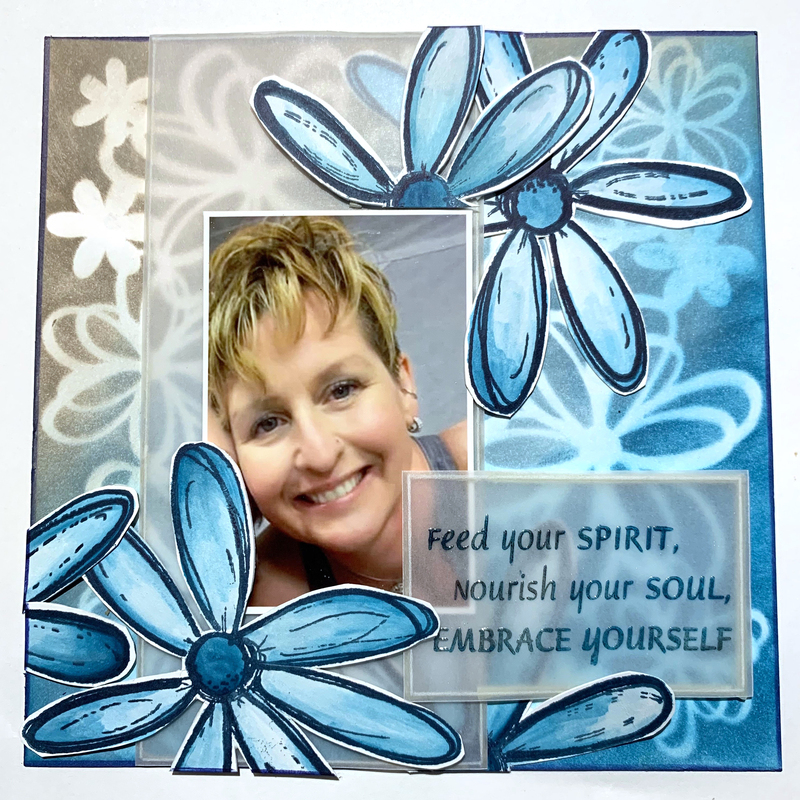 Hello everyone, Cathie Allan here today on the Creative Scrapbooker Magazine blog playing with Dare 2B Artzy! I have created 2 awesome quick & easy cards using two of her sets and one of her stencils. I kept the techniques so simple & fun that if you follow my articles in the fabulous, quarterly book, “Creative Scrapbooker Magazine” (you know it is “way” past “just” a magazine) you will probably know how I achieved these cards. With the first one …. my daughter, Leah’s birthday card, I kept the images quite pristine. The background was created using the Dare 2B Artzy “Wild Flower” stencil & the antique pewter section of the Home, pigment petal point from Clearsnap ColorBox and then the peacock & the harbor section of the Boardwalk, pigment petal point, creating an ombre look. 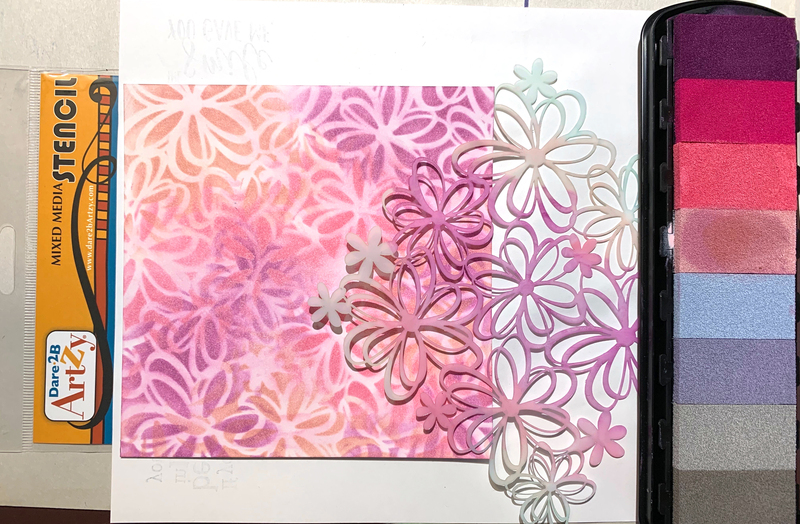 Yes, I used my Clearsnap ColorBox stylus and white foam tips to apply the color and blend them “seamlessly” into each other. I needed the antique pewter because that was the color of the shirt Leah was wearing and of course the blues were for her gorgeous, blue eyes. Custom made background for this great photo of her. I stamped the funky daisy image from the Embrace set in Clearsnap ColorBox Blue Iris, Fluid Chalk Ink. 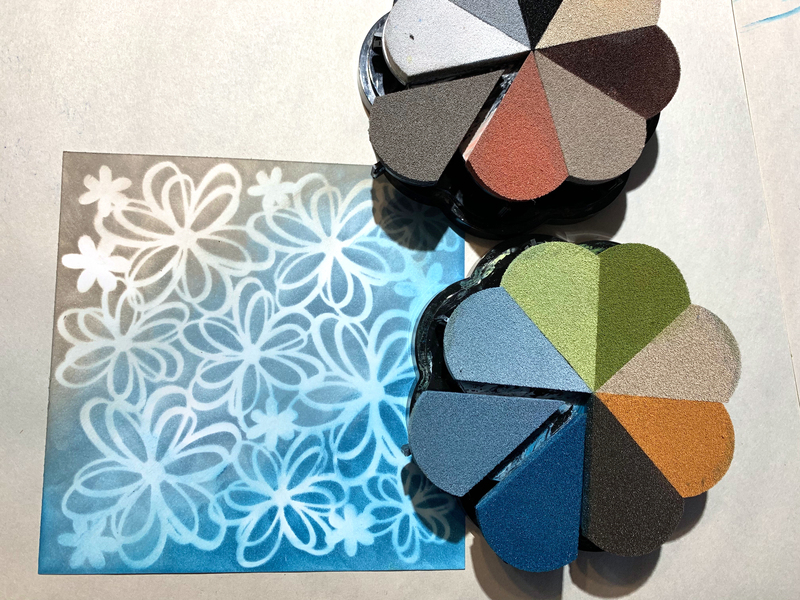 This “blended” ink is a blend of pigment & die inks, giving it the resilience of pigment ink and the quicker drying abilities of dye & beautiful detail. I did this in my Cathie Allan, Position-It2 from Ecstasy Crafts so that after I watercolour it with my water brush using the colors from my Boardwalk petal point, I could re-stamp my detail back in:). YES, you can gently iron on this board to set your ink. Simply place a piece of a heat resistant, craft sheet between your project and your baseboard and iron in quick, short bursts. I do this after I watercolor with my pigment ink as we know that pigment ink is like the “oil paint” of stamping mediums and it has a longer open time but “ironing” it sets it immediately. Notice the large clear handle that is attached to the left side is also my palette to pick up my pigment ink for watercoloring. Of course, I spotted a few other sets that I had to have and I when I am at another Scrap & Stamp Expo I will be adding even more of their stencils, stamps and dies to my 40-year-old collection. The “stamper in me” will not be able to be contained ….. or I will get them from “Scrapbooking Fanatics” in St. Albert, Alberta as Sandy has plans to bring them in. Whoo hoo! Awesome cards Cathie, I can’t say which one I love most. Hi Kathy. Love the stencil technique. Thanks so much for sharing.